McKinney, Texas – When one considers the options for laid-back summertime activities, computer coding may not be the first thing that springs to mind. But, for three computer science students from McKinney High School, there was no better time than June to be hunkered down in front of a computer screen. 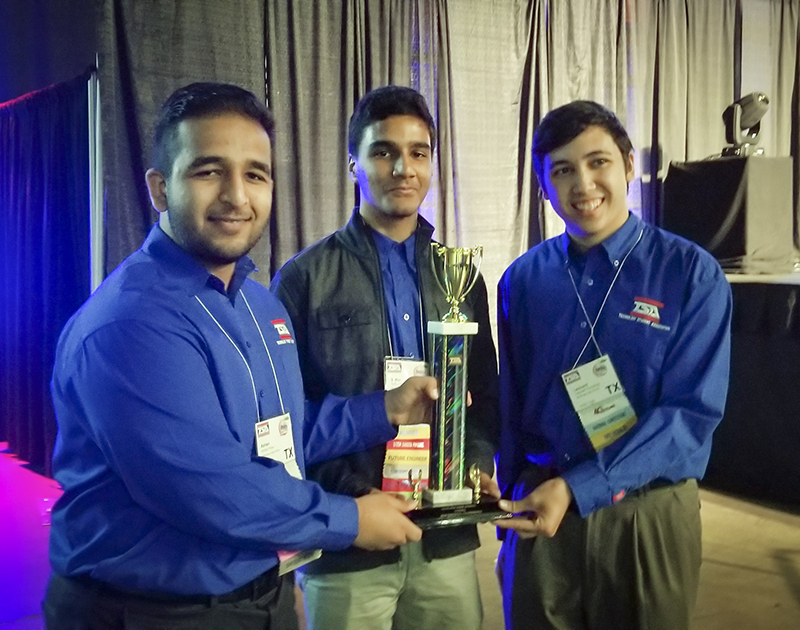 At the 2018 Technology Student Association (TSA) National Conference held June 22–26, that trio of MHS juniors—Azhan Khan, Saffat Ahmed and Leonard Humphrey—bested teams from across the country to claim the title of 2018 TSA National Coding Champions. McKinney ISD has emerged as something of a coding powerhouse of late; 2018 marks the second year in a row that a team from MISD has won the TSA National Coding Championship. Furthermore, MHS has won the state title for the last two years with McKinney Boyd High School finishing second. Last year, Boyd leapfrogged the state champions from MHS at the national conference to win the 2017 national title. This year, though, the team from MHS swept both the state and national competitions. Approximately 8,000 middle and high school TSA members competing in 30 events converged on the Georgia World Congress Center in Atlanta for the 40th annual conference in June. Those numbers represented only the top competitors from among the organization’s more than 250,000 student members. Competitors qualified for the national event by winning or placing second at their respective state competitions this spring, and McKinney ISD boasted an impressive contingent of 15 national qualifiers in various events at the high school level and five who qualified at the middle school level. “The magnitude of our students’ achievements is incredible when you consider that only the best of the best from each state were represented at Nationals,” said Robert Gupton, MHS engineering teacher and faculty sponsor of the school’s TSA chapter. Preparation for an event such as coding was a time-intensive pursuit, and success was the result of a great deal of hard work. As for the champs, they’ll be seniors this year at MHS, and they’ve obviously cracked the code on what it takes to win. While they savor the current victory, they’re already looking ahead to 2019.